Greenhouse Infoshop Project hasn't added a story. Greenhouse Infoshop Project started since 2012, We are located in Far South Luzon in Pacol Naga City Philippines, the only infoshop space in Bikol region. We do initiatives like Film Screening, Food Not Bombs, Art Workshops, Library, Community Gardening, Cycling Advocacy, Zine Reproduction & Distribution, Wilderness Survival Camping etc. Our Anti-authoritarian politics is more focused on community and ecology. We also organize events and get some small income, but it is not enough to pay the rent and the needed expenses in the infoshop. We are in financial distress right now. I hope you can help us raise the money needed to sustain our projects. If you want to see our activities and projects, please visit; www.greenhouseinfoshop.blogspot.com. 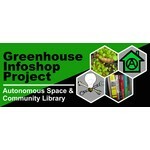 Greenhouse Infoshop Project hasn't posted any updates yet. Greenhouse Infoshop Project is managing the funds for this campaign.